On May 16, 1849, a plat was filed by Henry M. Rice & John R. Irvine, the first addition to St. Paul proper. 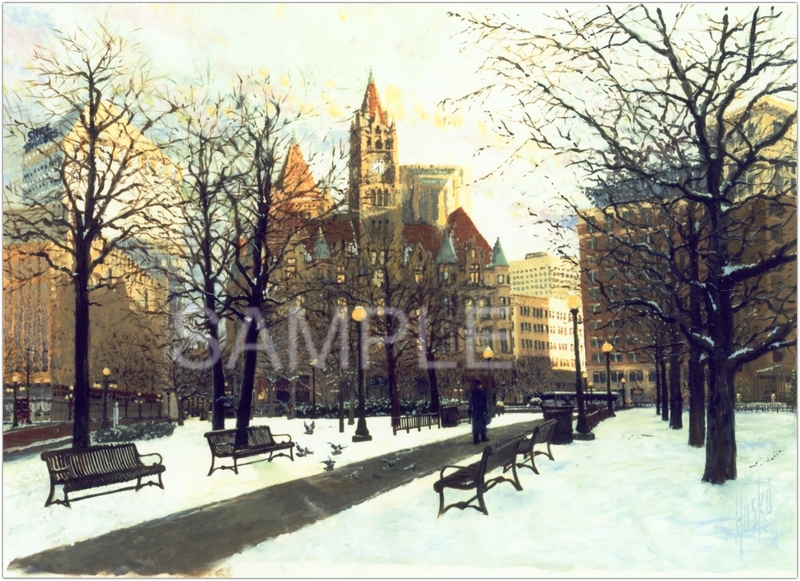 They designated Block 11 as a “Public Square.” Thus, Rice Park was created, though for many years the land was simply known as City Park. In 1860, Mayor Prince acquired the first trees for the park; Chief Gooding and other officers planted them. By 1875, a variety of buildings surrounded the park, most notably City Hall and the Metropolitan Hotel. The construction of the Romanesque style Federal Courts Building (Landmark Center) in 1901 ushered in a new era of large projects around the park. The St. Paul Public Library and James J. Hill Reference Library (1917-1922) was a high point of the Beaux Arts Movement. In 1910, the St. Paul Hotel was completed, followed by the Hamm Building in 1920. 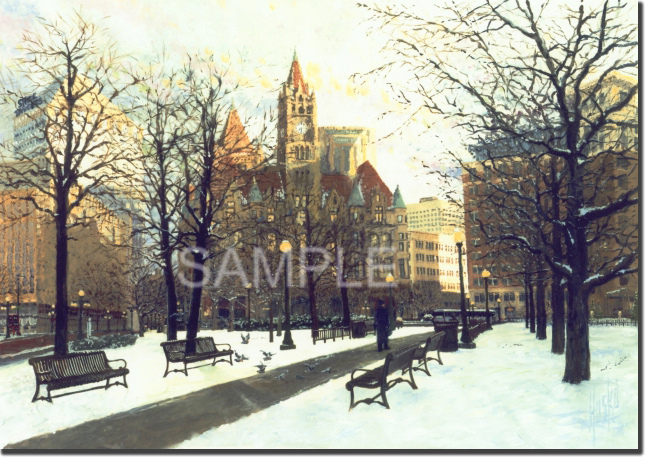 More recently, the beautiful Ordway Theatre, handsome Landmark Tower, and the corporate headquarters for the St. Paul Companies (Travelers) became high profile neighbors to Rice Park. 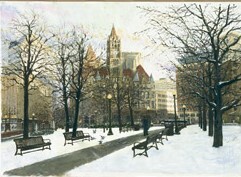 In March of 2004 artist Bill Hosko visited the park as the morning’s first rays of sun were reaching the heart of downtown. As he was about to photograph the beautiful sight, a woman on her way to work walked up the path …. perfect.